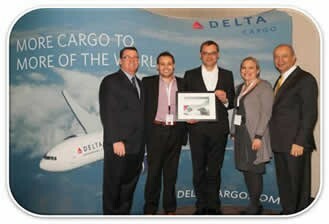 On the 16th of January 2013, during an annual global sales conference in Atlanta, Air Logistics Belgium was recognised as achieving the Most Improved Performance for Delta Air Lines in the EMEIA region. Air Logistics has represented Delta Air Lines in Belgium for 5 years. Delta Air Lines operate wide body services to New York JFK and Atlanta. “We are thrilled to be recognised as having the most improved performance for Delta Air Lines”, comments Jeremy Henno, Country Manager Belgium, Air Logistics Group. “Achieving this award wouldn’t have been possible without the hard work and dedication of our staff. It is them on the frontline offering exceptional customer service and realising our goals. I would like to dedicate this award to the team and thank them for their achievements”.